REACHING THEIR POTENTIAL IN 2016? 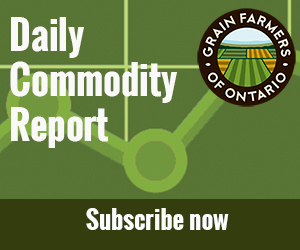 AMERICAN GRAIN FARMERS got 2016 crops off to a quick start as planting moved faster than usual for commodities in the grains and oilseeds sector. By May 15, barley was at 90% (71% average), corn seeding was 75% complete (compared to a 70% five-year average), oats were at 94% (83% average), soybean planting was 36% complete (compared to a 32% average), and spring wheat plantings were at 89% (64% average). With 68% headed, winter wheat was also progressing ahead of its 56% five-year average. Barley, corn, and oats planting effectively finished by the end of May, and soybean planting was 73% complete. Barring damage from late freezes or moisture problems, early planting is considered a positive indicator for a good growing season, especially when it leads to earlier corn pollination (before hot, dry, late summer weather kicks in). The acreage estimates reflect a continuing long-term pattern of declines in barley, oat, and wheat plantings and increases in corn and soybean acreage (see graphs below). A major factor driving that change is the change in corn yields, which have increased in every decade since the 1950s. By the 2010-14 period, corn output per acre was up 282%, according to a recent analysis by Gary Schnitkey at the University of Illinois. In comparison, the U.S. wheat yield for the same period is up 163%, barley is up 153%, and oat is up 86%. Another factor affecting U.S. farmers’ planting decisions is the availability of new corn hybrids that perform better in dry or short growing season states where barley and wheat have previously dominated. Examples include Kansas (now one of the top ten corn-producing states), the Dakotas, and parts of Minnesota. Now the question for 2016 is whether U.S. farmers will realize their production potential or face agronomic challenges that force changes in the WASDE estimates. With planting complete, it’s no surprise that weather will be the biggest influence on production — and as of late June, the weather outlook for the Corn Belt was unclear, according to Dr. Elwynn Taylor, Iowa State extension climatologist. Portions of the Corn Belt — much of Ohio, northern Indiana, about half of Iowa, and parts of Illinois and Missouri — have experienced some stress from a warmer and drier than usual spring, but Taylor said the damage was not serious as of late June. “We’ve had ample water in the deep soil, so crops with well-developed roots have not suffered much. If we return to near normal precipitation and temperatures, then we would anticipate the crops to maintain their good-to-excellent condition,” he notes. How the weather continues to play out will affect the disease outlook for this year’s crops, according to Dr. Alison Robertson, Iowa State plant pathologist. “There’s been lots of concern about northern corn leaf blight because it’s been a big problem, but the last couple of years have been cooler and wetter than normal,” she explains. “That environment favours that disease. Instead, gray leaf spot could be a problem if the season is warm and humid, and a warm, dry summer could mean problems with Fusarium ear rot and stalk rot in corn, she says. In soybeans, Robertson is watching for viral diseases such as soybean vein necrosis virus and tobacco streak virus, which is transmitted by thrips that thrive in warmer, drier conditions. Charcoal stem rot and soybean stem canker could also be an issue, and if the season turns really hot and dry, then aspergillus and aflatoxin become a concern.